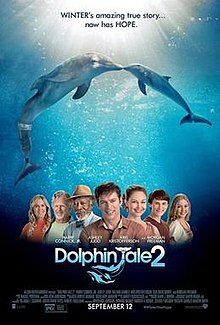 Dolphin Tale 2 is a 2014 American family drama film written and directed by Charles Martin Smith as the sequel to his 2011 film Dolphin Tale. Harry Connick, Jr., Ashley Judd, Nathan Gamble, Cozi Zuehlsdorff, Kris Kristofferson, Morgan Freeman, Juliana Harkavy, Austin Stowell, Betsy Landin, and Austin Highsmith all reprise their roles from the first film, while Lee Karlinsky, Julia Jordan, Taylor Blackwell, and Bethany Hamilton join the cast. It was released on September 12, 2014 and tells the story of another dolphin at the hospital named "Hope". After Winter's elderly companion and surrogate mother, Panama, dies, Winter's future is in jeopardy, unless Sawyer, Clay, Hazel, and the rest of the Clearwater Marine Aquarium team can find a new companion for her. Cozi Funny Outakes from "Winter,The Dolphin That Can"